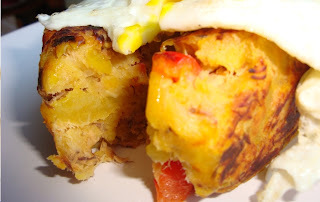 I got this recipe idea on Friday while I was in the changing room at the gym 🙂 The TV chef used potatoes and I thought, “This would definitely work with plantain”. I used no seasoning because plantains are naturally sweet. Cut the plantains into three pieces each (leaving the skin on). 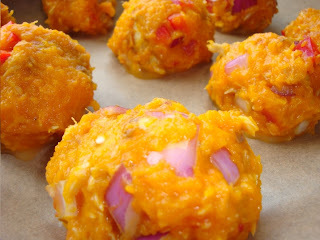 Add to a pot and add enough to cover the plantain halfway (max). Boil on medium to high heat for 15-20 mins. Chop the 1/4 onion into small pieces, same goes for the bell pepper. Remove plantain from pot and peel. Add the pieces to a big mixing bowl. Break an egg into the bowl, add the chopped onion and pepper. Mix contents with a wooden spoon, the result should be very thick. Add a teaspoon of olive oil to a pan and fry the onions in the pan. When onions are brown, toss them out. Add the cakes to the pan and pan fry on low to medium heat. the cube shape comes in handy because you are able to turn it on all six sides. It took a total of 10 minutes to cook. 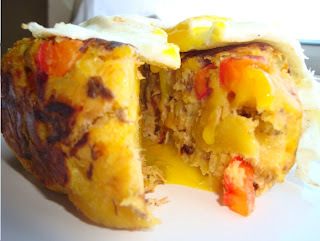 Fry the egg and serve with a ‘cake’ (as seen in the pictures). Use vegetables of your choice, I’m going to try spinach next. You can use sweet potato, butternut squash, yam, potatoes, etc. 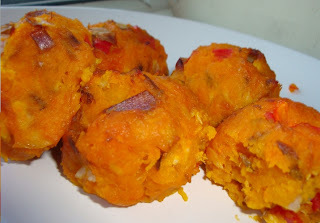 This entry was posted in Eat In, Healthy Eating, Healthy Nigerian Recipes, How To Cook Healthy Food, Plantain, Recipes on June 19, 2011 by Adura Odesanya. Sounds yummy! I am going to try this… but after you fried the onions, what did you do with them? OOps…ps, I am so sorry you are under the weather, the Lord’s blessing and strength for you this week. Very creative way of having plantains, yummy. Thanks for stopping by my blog, hope u have been doing great n are feeling much better now? awesome!will definitely be trying this soon…without the runny egg!!! looks great! I will like too bake it for sure. a bit confused or maybe i am just slow. so one of the eggs go into the mix ya? and the other is fried separately? which oninons are we frying, the one in the bowl or another one. why are we tossing out all that onions naa? – Yep, one egg in the mix. – Ooops, didn’t write that clearly… you add chopped onions and peppers to the mix and you fry (max) 1/4 of an onion just to add a ‘kick’ to the oil. Yep, you toss cos if you leave it in the pan, it’ll get burnt. PS Try the butternut squash version too, it was YUMMY! I’m gonna make those tomorrow evening.